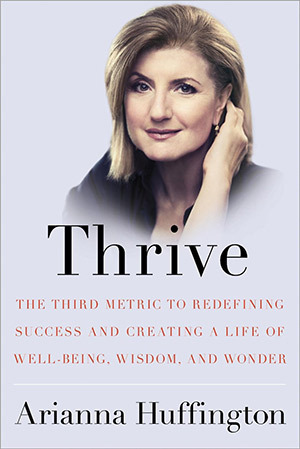 Thrive: The Third Metric to Redefining Success and Creating a Life of Well-Being, Wisdom, and Wonder. Get more sleep – start with 30 minutes extra by going to bed earlier. Put away your phone – use a baby step technique by disconnecting a half hour at a time. Introduce stress reduction techniques – five minutes of meditation, walking, stretching or yoga. Easy enough if you incorporate these steps into your daily routine. It took me a while to finish the book and to connect with the “we must sleep more” mantra. I agree completely with the message, but that may not resonate with a new mom trying to breastfeed at 2 a.m. It didn’t resonate with me at first. I realized that even the chaos of new parenthood will give way to routines and schedules. That’s why her overall message of self-care is so important. We have a choice when it comes to how we use our time and control our thoughts. Thrive techniques are designed to feed your soul and nourish your mind. The chapters include Well-Being, Wisdom, Wonder and Giving. It’s a new way she defines success without any focus on money and power. Both of which we know don’t equal happiness. Well-Being shares how it’s important for focus on you first. You’ll learn self-care techniques, focus training and how to redefine your definition of success. Wisdom is a way we weave together our strength and vulnerability. Learn how to recognize what you’re really seeking in life and create a more genuine, meaningful and fulfilling definition of success. Wonder is more than gazing at beauty, unraveling mystery or learning with intrigue. It’s a product of our state of mind, being and perspective. The chapter about Wonder provides ways to get back to living in the moment without a cell phone, social media or electronic distractions. Giving is a service to humanity. Redefining success to thrive is about more than just you. It includes stepping beyond ourselves with love, compassion and empathy. Find out how you can serve humanity in even small ways every day. Backed with research, Huffington’s Thrive outlines how we’ve lost our way in the digital world, social media and apps. It’s a wake-up call to get back to the basics. Listen to your heart, feed your soul and serve others. That’s the new way to define success so you can thrive. What part of your daily routine helps you Thrive? Great review. She spoke at a conference I went to last year. She was so inspiring and amazing, but I have to admit that I haven’t really taken her advice. I want to though. Thank you! I think that’s why it took me so long to complete the book. I had a hard time connecting with the “sleep more” message. It’s so important to get sleep, but a hard to do with little ones. Her kids are adults now. We do turn off the devices before bed.That helps. I bet she was amazing to hear live.